in this race will beavailable on this website on Friday, Oct. 13. A written transcript may be ordered for $3 postage and handling. Call the Journal office at 826-2000 to order. Letters to the editor are encouraged. The candidate: Connie Miller, 56, incumbent, 30-year resident, business manager for husband's dentist practice; elder, Presbyterian Church; board of directors of: Boys & Girls Club, Keep Eureka Beautiful, Eureka Theater Concert and Film Center; lifetime member, California PTA. Support: $6,000 as of 9/30. Biggest donors Rob Arkley, husband of fellow Councilmember Cherie Arkley, $500; Harvey Harper, $400. Plans to spend $10,000-$12,000. Issues/vision: Good-paying industrial jobs, but top priority, "keeping Eureka a livable city ... creating a beautiful community is one of the major components of economic development." Notable quote: "We absolutely have to look at this as a regional economy. As long as the jobs stay in the county and Eureka remains the urban city where people come to do commerce, we will thrive as a system." The buzz: Loyal, hard-working girl scout. Is she too nice for politics? Support/supporters: $13,706 as of 9/30. Largest donors Arlene Banducci, $980 (grandmother); Judy Billingsly, $400; Mary Schmidbauer, $500; Pierson's Building Center, $500. Plans to spend $15,000-$20,000. Issues/vision: "Key to the future is attracting high tech and industrial jobs." City lagging behind in maintaining parks, infrastructure. Notable quote: "From student government, to coaching basketball, to counseling youth, I have always had the courage to make tough decisions. The buzz: Even his supporters call him "the kid." Great Humboldt County pedigree (grandson of the late Judge Dominic Banducci, grandnephew Superintendent of Schools Louis Bucher). Short resume. The candidate: Virginia Bass-Jackson, 38, restaurant manager for O.H. Townhouse, named for her late father, former Supervisor O.H. Bass. Member, Eureka Chamber, Henderson Center Kiwanis, California Restaurant Association. Support: $9,200 as of 9/30. Largest donors, Harvey Harper, $400; Judge John Morrison, $400; Who's who of Eureka Chamber. Plans to spend $15,000-$20,000 which she will have no trouble raising. Issues/vision: Too much bickering on current council. Existing parks neglected, average citizens feel left out of the loop. Notable quote: "It is necessary that the city of Eureka allow business to thrive while maintaining our unique character and small town charm." The buzz: Some are calling her a shoo-in for Gupton's seat with solid business backing. The candidate: Peter La Vallee, 51, director of Youth Services Bureau (90 employees, $2 million budget), former teacher. Support: $3,800 as of 9/30. Biggest donors Dr. Joe Walsh (father-in-law to be) $1,000; Bill Pierson, $500. Plans to spend about $6,000. Issues/vision: "Eureka citizens deserve the best economy, jobs, wages and city council. The challenge for Eureka is to maintain its quality as a small city yet develop it so that the people who live here can earn living wages and benefits and be healthy." Notable quote: "I don't know if the City Council ever said to its city manager, `It's your job'" to bring in good-paying jobs. The buzz: Strong on social services, weak on business/economy/growth issues but probably the only candidate who can really read the city budget. The candidate: Brent McCoy, 30, on Social Security disability. Originally from Massachusetts. Came to Humboldt two years ago via Oregon and Marin. Support: Zero, with no plans to raise money or actively run. Promises to show up to debates if he can find transportation. Issues/vision: "I think everything's fine the way it is. Just keep things going the way they're going. ... We should have all the industry we can, it's a free market society." Headwaters money? "They should put a new entrance out there on Elk River Road." Notable quote: "I filed bankruptcy years ago. That's how I ended up homeless.... I just want a job in politics. It's a paying job ... $500 for (meeting) maybe twice a month." The buzz: See notable quote. RICK BRAZEAU, OWNER AND CREATIVE DIRECTOR OF MTC ASSOCIATES, an Arcata-based ad agency, says the Eureka City Council race "is going to be very, very interesting. "My sense is the people of Eureka are really tired of what's going on, tired of all the antics, and if there was a way to do a clean sweep, they'd do it." 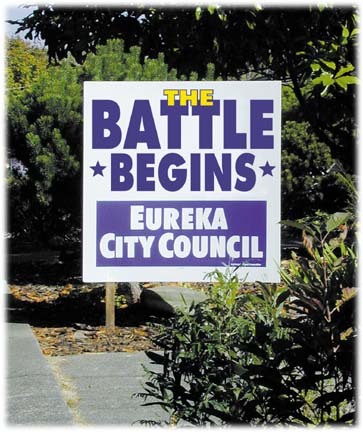 There is no doubt the last two years in Eureka politics have been contentious. First there was the Walmart Measure J initiative. Walmart spent hundreds of thousands of dollars in an effort to force the City Council to rezone a large industrial parcel opposite the waterfront -- known as the balloon tract -- to accommodate a retail store larger than anything Humboldt County has ever seen. The measure was soundly defeated by voters last November and Brazeau's company ran the successful "No on Measure J" campaign. Then there was the firing of City Manager Harvey Rose, who many felt was too friendly to Walmart. And there was the bungling of the balloon tract gift. After Measure J was defeated, Rob and Cherie Arkley -- Cherie sits on the council but is not up for re-election -- offered to give the city $3 million to purchase and clean up the balloon tract. In what appeared to be a giant chess game (or a comedy of poor communication), the council first voted to accept the gift but later tabled the proposal. The council also voted to put the proposal on the ballot for an advisory vote but later reversed itself. The Arkleys finally rescinded their offer due to "council and city management instability" -- certainly an understatement. Brazeau hopes this stewpot of controversy will propel Bass-Jackson, a popular restaurant manager and daughter of former Supervisor O.H. Bass, into Gupton's vacant seat in Second Ward. And he hopes the anti-council backlash will be strong enough to unseat Connie Miller, who was appointed by the Mayor Nancy Flemming and is running for her first four-year term representing Fourth Ward. Miller almost didn't run for re-election because of the contentiousness of the past year. Along with Arkley and Flemming, she supported City Manager Rose, calling him forward-thinking, "a visionary." Miller was especially upset that he was fired midyear after just having his contract renewed in February. He was the fifth consecutive city manager to be dismissed in such a manner, something she attributes to Eureka's good-old-boy network. She says the city lacks a good process for evaluating and retaining administrators -- not to mention fending off pressure from business interests who want to change city managers. "I think we need more open communication. We need to grow up as a city and the council needs to grow up as a council and learn management techniques that will move this city forward," she said. Regarding Measure J, Miller said she is not opposed to big box stores, but, as a private citizen, she voted against Walmart on the balloon tract. "As a council, we had nothing to vote on yet. For a councilmember to take a position before something is bought to us is not appropriate. Walmart was in town principally to deal with a private landowner. I `made nice' with Walmart because they made it perfectly clear there would be a lawsuit for restraint of trade if we (the council) said no to Walmart." Her opponent, Kerrigan, takes the same position. "I opposed Walmart -- in that location," he said, but he is "not particularly opposed to Walmart" or other chain retailers. Kerrigan says the public dissatisfaction with the council in general and his opponent specifically is deeper than Walmart. It is the feeling that the council, the mayor and the former city manager have been actively recruiting retail stores as the primary focus of economic development. "It can't simply be a retail and tourist economy," he said. "To bring in retail businesses that pay minimum wage with no benefits, that's not good enough for people in my age group. "Too many of my friends come up to me -- from the day I left high school to today -- and say they are leaving the area because there is not any opportunity here." Miller said that the notion that the city actively recruits retailers is nonsense. Retailers come to the city for information on permits and zoning, and the staff has a responsibility to respond. Regarding economic development -- going after those good-paying industrial and high-tech jobs -- there is a lot of work being done by the city, the county and other agencies, although much of it is not on the radar screen of the media and much of it is fragmented, she said. "I think we need to sit down and say, OK, 20 years from now, what is Humboldt County going to look like -- and be specific," Miller said. "One of my big frustrations in coming on the council was, we don't know where we are going. How do you get there when you don't know where you're going? And you fire your city manager for not doing what you want, but you've never told him what you want." Miller said if re-elected she would like Eureka to hire a professional facilitator to coordinate a city-wide process, similar to the general plan review, to come up with a "20-year vision" like Portland, Ore., did 30 years ago. "They wanted open space, they wanted green, they wanted beauty, they wanted livability -- and they wanted (economic) development," she said. "In 30 years, they accomplished it. ... We need to talk to (Portland and) cities like Fort Collins, Colo., and find out how they did it." Miller said she is also frustrated at the lack of professional marketing of the bay, which she said has become a city responsibility by default. She said there is a coastal city in Washington with fewer resources than Eureka, "and they have two full-time people out selling their harbor." Regarding the $22 million the county has in the bank from the government following the purchase of Headwaters forest, Miller said, "I think we should come up with a plan for economic development" -- and spend it. "You have to spend money to make money. That's the first thing you learn in business." Miller mentions the "Prosperity" document, a report recently adopted by the county as its primary guide to economic development, as being a key to future development. "It's a wonderful document. (It) approaches economic development from key areas -- looking at industry clusters, looking at quality of life, looking at what we have already have here and how do we build on it without ... dramatically changing the character of the North Coast." Kerrigan also calls "Prosperity" an important document. "I especially like the idea of us operating as an economic region, of not competing with each other, allowing small businesses to grow to produce more jobs," he said. Kerrigan said the city should be more proactive in its search for industry, especially high tech. "Having land available for light industry and high tech businesses (is important, but) ... it's going to take a professional marketing task force to go out and sell this area to businesses looking to relocate." In addition to their similar views on economic development, Miller and Kerrigan agree on the importance of tourism (only a piece of the puzzle, we need industry and good-paying jobs) and infrastructure improvement (keep plugging away). But on a few issues Kerrigan, a Democrat, sounds more like a Republican than Miller, who is one. Kerrigan said, "I really think the city should stay out of dealing with private property, generally." He calls the city's involvement in the Daly project "a mistake." He is also critical of sales tax increment financing, which kicks back some sales tax to a business to encourage expansion. Miller, 56, says she thinks she has done a good job for the city and would like to continue. Kerrigan, 20, says voters are unhappy and he's offering a choice. "I think people may see (my youth) as an issue," Kerrigan said. "I'm a citizen of Eureka. I care. I know the issues. I think I can do an effective job. I'm old enough to die for my country." Kerrigan has deep roots in the community -- his grandfather was the late Dominic Banducci, his granduncle is Superintendent of School Louis Bucher -- and he has tapped into his St. Bernard High School and other community connections for support. Political observers see this as a two-horse race between Bass-Jackson, who manages OH's Townhouse for her mother, Shirley Bass, and Peter La Vallee, a former teacher and the director of a nonprofit agency that runs shelter programs for troubled and at-risk teens. Bass-Jackson said she is not intentionally running in conjunction with Kerrigan -- it's just that a lot of her signs end up on front lawns with his signs. And, of course, they are using the same ad agency. She, too, senses voter dissatisfaction. "Connie (Miller) comes from the aspect that you fix the outside -- the parks, the trails -- and then people will come. From a business perspective ... do people come because you've got the parks and the facilities? Or do those come after people come for the jobs?" Bass-Jackson said it's not just the dissatisfaction, Harvey Rose and the divisiveness. "There are other things, the way people behave in public. ... I think outbursts don't serve the council well. That can be done behind closed doors." She, too, was opposed to Walmart on the balloon tract last year and is not opposed to chain stores in general. "We may squawk when a new (chain) restaurant comes in," said the restaurant manager. "But that's what business is. We learn to survive. "I shop Home Depot when I go out of town. As a mother of four teenagers, when I go to Crescent City I shop Walmart." Bass-Jackson favors "non-smokestack" industrial but has doubts about high tech. "I'm not sure how realistic that is at this time." She said a friend of hers, who is a vice president of Intel Corp., said Humboldt County has some definite negatives. "He mentioned the perceived lack of workforce, lack of education -- that surprised me -- and the airport. They want to be within an hour of an international airport." Bass-Jackson suggests that the city may want to join with HSU and College of the Redwoods to develop programs geared more toward high tech needs. She said she is still reviewing the "Prosperity" document. "It sounds good (but) I question the implementation. In the past many things that we say we are going to do, we haven't really put into practice." Bass-Jackson said many people urged her to run for mayor two years ago against Flemming, but the timing wasn't right. She is just completing a term as president of the Henderson Center Kiwanis and she says she now has the time and energy for the council job. Like Bass-Jackson, La Vallee said he would not be running if Gupton were still in the race. Unlike Bass-Jackson, he is not a Eureka native. "I came of age in Michigan in the 1960s," he said. "I moved to Humboldt County after the Detroit riots of the '70s." La Vallee received a teaching credential from Humboldt State and was a substitute teacher before he landed a job in Trinity County working with youth, a job that lasted five years. "In 1985 I came back and accepted the position I've had ever since," working with young people "to help them become productive and capable members of the community ... to divert them away from our justice system and our welfare system." La Vallee oversees a $2 million budget that employs 90 people. The Youth Services Bureau, a division of Redwood Community Action Agency, runs three residential treatment programs and three thrift shops that generate revenue for the programs. Most people would think so, but La Vallee resists that label. "Somehow in our culture, we have become terrified of kids and I don't know why. I think it's because we have Littleton, Colo., episodes on our minds and it scares the hell out of us." "I've been interested for a long time, but what made me decide was ... Gupton wasn't running and now was the time to put my vision into it. I love this town and I don't like some of the direction it's taking." He said he grew disillusioned with Gupton. "I supported him. I wouldn't support him again. He became very wishy-washy. I don't think he had the fortitude." La Vallee said he wants west of Broadway light industrial, and attention focused on small port and waterfront development. "I like some of the `Prosperity' stuff about building the businesses we have and supporting them. (But) this city has tried to attract jobs for 30 years ... and obviously it hasn't done a very good job. I don't know if the City Council ever said to the city manager, `It's your job.'" Chain stores? "If there is control about where they go." Tourism? "Important, but I think we're blowing it. I think Mark Carter (owner of Hotel Carter) is right when he routes people off Broadway to get to his hotel. It's ugly!" La Vallee said he has looked over the city budget. "It's pretty small and there's no discretionary." He was surprised by low wages in some categories. "One woman worked 19 years in the police department and she's making $1,900 a month." La Vallee said he's on a fast learning curve. "There seems to be a shortage" of light industrial land within city limits -- all candidates agree with that -- and suggests the city may look into annexation. "This (economic development) is newer stuff for me because I'm coming from a social services (viewpoint). But there isn't enough land (within the city limits)." "I'm delighted it wasn't put into the (county) General Fund like the tobacco money."